Our world has gotten even smaller. Great interest in the tragic passings of strangers is nothing new. However, when much of the world is separated by only a few degrees of friendship on social networking sites like Facebook, we become aware in a more personal sense of the loss of someone half the world away. My hope is that in focusing online, we don't lose touch or forget to support the grieving person who lives across the street. They may be strangers from all walks of life, but the death of the 28—year—old Singaporean lawyer has brought the nation together in a common outpouring of sympathy. Sympathies have been pouring in from Internet users as well. A memorial group page on social networking site Facebook has seen its number of members swell into the hundreds since it was set up early Saturday morning. 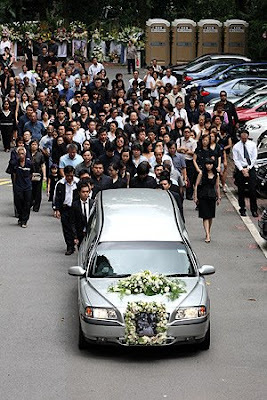 Some 200 people followed the hearse carrying Ms Lo Hwei Yen's coffin as it left for Mandai Crematorium after a service at St Teresa's Church. Thousands more mourn her online. 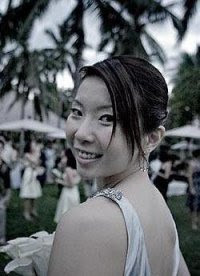 "May her passing, as the first Singaporean to have lost her life to terrorism, serve as a reminder to everyone, Singaporeans and non-Singaporeans alike, to treasure life and the loved ones around us.Yen lived her life with passion and she treasured her friends & family dearly. Let us cherish the zest for life and through us, she lives on. Yen, thank you for your smiles and for touching our lives. We miss you dearly."